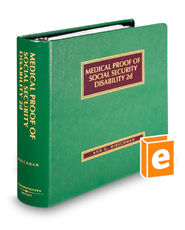 Medical Proof of Social Security Disability includes everything you need to present a comprehensive picture of a client's disability. It shows how to establish the requisite medical proof of a client claim using fundamental information such as anatomy and medical charts. In clear language, the text walks through the elements of proof of each of the Social Security listings. Features include information on the ICD-10 code, illustrative diagrams, and a glossary of diagnostic tests and procedures.